This weekend certainly was eventful – an entire nation setting their clocks (well, the west coast at least) to wake up at an unreasonable hour to watch our hockey team win the gold medal. After our win to the US on friday the early morning wake up call was inevitable. I didn’t want to get up at 4 am, but I did – for our country and all. It was fun to watch, though not quite as exciting as our last gold medal game (the overtime goal by Crosby was awesome) but fun nonetheless. I went back to bed at about 6:30, and then woke up again at 10:30. Thank goodness it was a sunday morning game. Another surprise to the weekend was a huge snowfall. It began saturday morning and didn’t stop well into Sunday night. We had at least 6 inches before I went to sleep, and more on the way. It was so snowy and windy that there was snow right up to our front door, and on it. I stayed in most of the weekend, making my way to the gym and making Lainey go outside for a walk. She was hesitant, but once there were a few paths shovelled out for us she didn’t mind it. I tried to make her go out again before bed but I think the whole ‘theres snow up to the door’ thing discouraged her. She is only about 10 lbs and therefore quite low to the ground – I don’t blame her. This pasta dish is easy and really delicious. 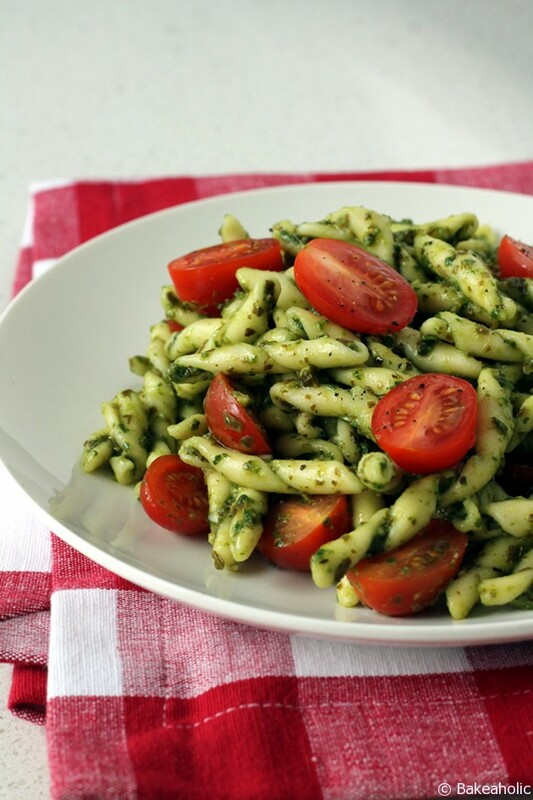 I have made spinach pesto quite a few times before after discovering how easy it was – you don’t even need to have pine nuts on hand to make it. A simple spinach + garlic + olive oil + lemon juice does the trick. My mom used to make a dish similar to this when we were younger, only it would have olives (which I didn’t have on hand) and lots of cheese (which I can no longer eat because of a dairy allergy) however, my version is still pretty delicious. I think it’s all the garlic. The best thing about this is you can eat it both hot or cold. I love it both ways – although I think I would prefer it cold. I usually eat it hot the first night for dinner, then I’ll have the leftovers cold for lunch the next day, adding more tomatoes to it as I go. A pasta with lots of ridges is best for this dish, I used strozzapreti, but a penne or rigatoni would also work. An easy pasta dish that tastes delicious both hot and cold. Wash the spinach. Toast the pine nuts on a pan over medium heat until lightly browned and fragrant. Add spinach, toasted pine nuts, garlic, a dash of lemon juice and olive oil, and black pepper in a food processor. Bring a large pot of water to boil. Cook the pasta according to package instruction until al dente. 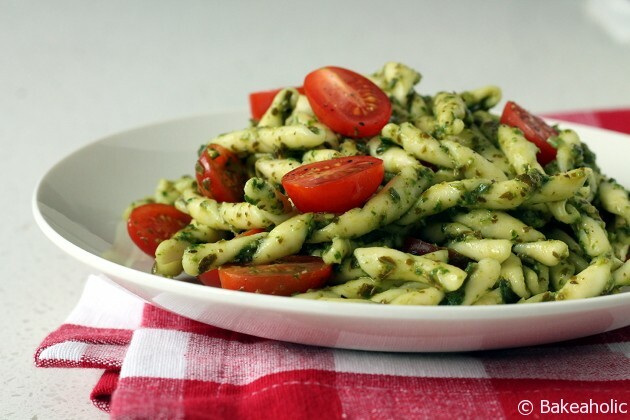 Drain the pasta, and toss with pesto. Add the sliced tomatoes. This pasta is delicious both hot and cold. I like to enjoy it hot for dinner, and cold for lunch the next day.